Here is my entry for http://sassycherylschallenge.blogspot.com/ i loved this one as i really love using no trad red and greens and as this was made for Octobers Breast month awareness .I do like normal red and green ones too .This is first card i have made for a week and im hoping health and mo jo remain in tactc .Bye for now speak soon .x ps i forgot to say that the snowflakes are done by hand using stickles stardust . It's stunning Fairysparkle: I LOVE the pink myself and it's perfect for winter regardless of it not being the red/green. I LOVE IT! Thanks for playing in the Sassy Cheryl's challenge this week. Your creations always make me smile. Miss Fairysparkle!! this is Awesome my friend! 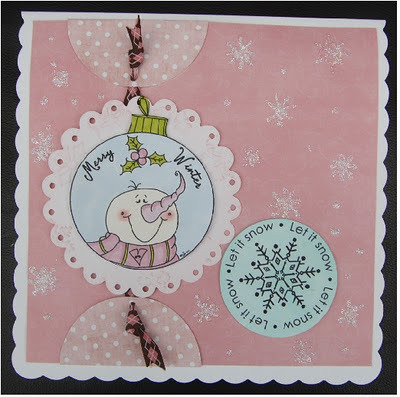 love the soft pinks and your wonderful take on the inspiration piece this week! I am SO glad you felt up to joining us for the Sassy Challenge this week... it is always fun to get Sassy with you! Awh, Ms. Fairy, lovin' this card! Read that you were feeling well enough for a little shopping trip. Can't wait to see what you create with your new purchases! Thank you for joining us this week for Sassy Cheryl's challenge!